Former President Maumoon Abdul Gayoom has confirmed he is pursuing legal action against newspaper Miadhu, after it reported that the New York Times had published a story containing allegations he embezzled US$400 million during his time in government. Spokesman for Gayoom, Mohamed Hussain ‘Mundhu’ Shareef, confirmed that Gayoom was also building a case against Finance Minister Ali Hashim, who was quoted in the NYT article, and former Auditor General Ibrahim Naeem, upon who’s 2009 report the article was largely based, as well as the proprietor and managing editor of Miadhu. Contrary to earlier reports, Gayoom was not seeking to sue the NYT or the author of the article, Matthew Saltmarsh, Mundhu said. “I think that’s been misinterpreted, we have no interest in Saltmarsh,” Mundhu said. “We don’t know him but we’re sure he’s a good journalis, and the NYT is obviously reputed and widely circulated globally,” he said, adding that Gayoom’s response had been to send a letter the NYT editor. Mundhu noted that according to the NYT article, the journalist Saltmarsh had claimed he attempted to contact Gayoom for his side of the story. Mundhu said he did not believe such an article was justified without a right of response, and that Gayoom had written to the NYT editor requesting a right of reply, or a correction. Mundhu said Gayoom was more concerned with the story being reported in the local media. “We want to address [the matter of] the ruling party’s engineering of the article for political benefit,” he said. But he added that comments made by Finance Minister Ali Hashim in the NYT report did not come from the Auditor General’s report – “this US$400 million [alleged embezzlement] is something he’s conjured up in the Haruge (MDP headquarters),” Mundhu said. “Until a court rules that the Auditor General’s report was fabricated, the media has a right to report it – it is a public document. Until then, the media can write about it five times daily if they wish,” he said. Latheef added that he was looking forward to the opportunity the court case would provide to open the orginal audit reports to public review. Speaking yesterday at the Commonwealth’s media development workshop, Attorney General Husnu Suood acknowledged that if an article was published in the Maldives, even if the source was from abroad, the onus was still on the particular journalist to prove its truth. Hashim had not responded to Minivan News at time of press. No comments, Qayoom, you seriously need to learn from the past mistakes and understand that you cannot fool everyone all the time..
and this government cannot gfool all the people all th etime. If there was evidence, do you think Gayyoom will be sittigg at home. Maldivians have been taken for a ride once, but no more! ooh oh oh..so hurt ha. Did you family, relatives and friends enjoy the luxurious lifestyle with your hard earned money. Can you prove that. Gayoom knows the present Maldivian judges are his implants and can do anything he wants. This explains why he will not sue NYT who actually published this. In any normal circumstance, it will be the newspaper that published the article who gets sued not the people they interviewed. He knows sueing NYT at a court he does not control will see him exposed for who he really is. This also will put a presedence where there cannot be any allegations at all. Eveytime police says they are investigating a person or they annouce they have detained someone we can sue them for defamation. 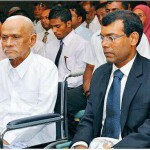 By the way, what dignity does Maumoon have to protect? To his followers, he is a god-like figure and cannot do anything wrong by default. For the rest, he has committed just about all hideous crimes a man can commit so what is he trying to achieve? Money...? Former Nigerian President Sani Abacha was alleged to have looted $5 billion from his country and stashed it away in foreign accounts. Later, $700 million of that was recovered and repatriated back to Nigeria. If the Maldivian authorities can return a similar proportion of the $400 million that Gayoom and his cronies are believed to have stolen, then it would be fully worth the trouble to get the money back. It should be noted that this is not about vindictive political opponents out to score a political point. Rather, the World Bank and UN believe that the former regime did pilfer from state funds. That is why they are helping the Maldives to recover this money. This attempt by Gayoom to discredit the New York Times will not work. I wish he would sue them rather than our public servants/local media who just want our money back!! Gayoom is now well and truly established in international opinion as a corrupt dictator on the same footing as Abacha, Mobutu and others. If he didn't want this to be his legacy, he should have been an honest leader when in office. Didn't he build a palace that cost the nation millions of dollars? Didn't he have 55 cars? Didn't he buy a luxury yacht? Didn't he make his family and friends rich? The answers to above questions are clear. We look forward to hearing when you make your case at court against those interviewed by NYT. You will come out naked because you have robbed the state's treasure. NOW TRY TO SUE ME! People should also know something about this Gabbey Latheef. He earlier busy publishing DRP news latter Hamaroalhi . Why should we pay any respect to these kind of vultures. Go to bed dude. You are not helping and you sound like a moron. Old, ugly and desperate. Where were the World Bank and the UN from 1978 November 11 to 2008 November 10? Did they not see the grand Theemuge? Did they not see the fleet of cars and boats that belonged to Theemuge? Did they not see the national budget that spent about 13 million dollars on his household annually during the last 3 years of his rule? Where were the MDP affiliated MPs when these budgets were passed in the Majlis? And when the country is faced with huge deficits why did not the Majlis pass a reduction in the members own pay package? And now why are they so many political appointees in various posts? Is there no comparison between Gayoom spending money on his cronies, family and the in-laws and the present regime spending money on "activists"? Loa Laariehggaves Jehifakaneh, jehifakuneh, saabahey Gayyey, Barak Ob ves miburuga indhaalaathi. Is Gayoom going to sue NY Times as well? Or does he not have as much faith in the judiciaries outside of the Maldives? Gayoom is the biggest thief but I support him. I am fed-up of Maumoon this and Maumoon that on every election. 80 now it's 400 million dollars.. But not a single penny is found. Not a single person prosecuted or convicted. This is hilarious and sad at the same time. This Anni government is playing games. What is that presidential commission doing wasting public money??? Does the NYT article say that Gayoomm got NAPPIES airfreighted from UK? when Maumoon wanted to chase Mr. Ilyas Ibrahim, his own brother in law, from Maldives,He did. Maumoon forced Mr. Ilyas to run away from maldivescv Maumoon came to TV and said Mr.Ilyas has run away with 27 luggage full of money and Mr. Ilyas has hijacked a plane at the airport.After just few months same maumoon said Ilyas is not guilty for anything. After some times lot of land is bought and registered on Nasrenas's, Gayyooms' wifes and children name.. what a drama. FPID 280 million dollars is majority shares brought to gayyom's pocket..still gayyoom is mater faithful? ?